ow do you instill nationalism in the Indian State? Specifically the Indian Government that is supposed to be its guardian and servant? Odd as it may seem, the question is legitimate. For how else could one explain a major public sector undertaking like the Metals and Minerals Trading Corporation (MMTC) sponsoring a blatantly anti-Hindu and anti-national photo-exhibition on Kashmir, at the India Habitat Centre (IHC) in the heart of the capital. Except that the exhibition was neither so pure nor so innocent as that. Indeed, it can be said to be remarkable only for the sheer dishonesty of presentation, for deliberately effacing the genocide and forced exodus of the native Hindu community from their natal home and hearth; purging the burnt homes and broken temples and shattered families that remain; and showcasing lumpen stone-pelting youth as heroes of a seditionist cause, while presenting the Indian security forces as an illegal and illegitimate presence in the Valley, rather than as our last line of defence against the fragmentation of our territorial integrity and national sovereignty. What stands out in the exhibits of Shome Basu, son of an East Pakistan refugee Hindu family that is in complete denial of the grim pressures that drove them away from their native soil, is the refusal to show the Tiranga that has so often been burnt and disrespected in the decade in which he made his forays in the valley. Recall the valiant (sic) Muslim women (sic) who stamped the national flag under their feet on Republic Day and shouted ‘India ragdo, ragdo’. Yet there is a particularly garish and carefully posed picture of Hurriyat Conference chairman Syed Ali Shah Geelani extolling youth to revolt against the Indian State, with the Pakistan flag in the backdrop! Basu seems unmindful of the fact that Geelani is currently being investigated in New Delhi for treason against the nation for his indecent utterances at the Little Theatre Group Auditorium in the capital last year. 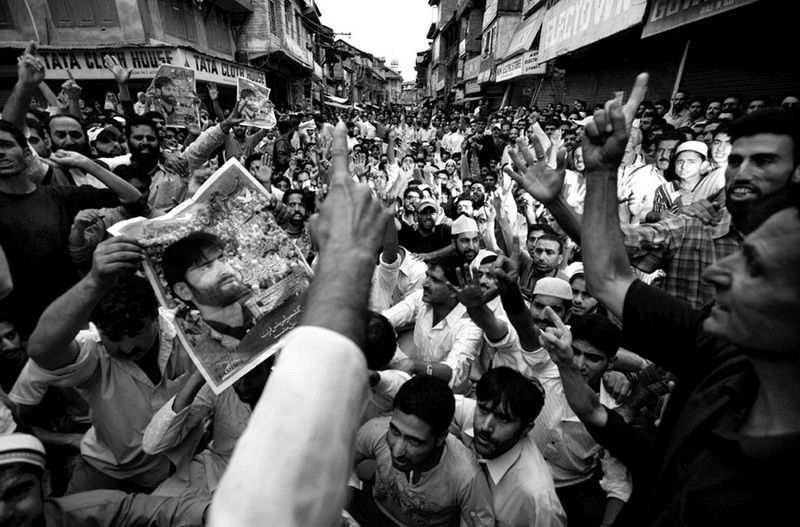 One wonders how the Gallery allowed this picture, as also another carefully posed exhibit of a rally with huge paper posters of JKLF terrorist Yasin Malik, who is being tried for the murder of five Air Force officers in broad daylight, as they were standing on the roadside waiting for their official transport in Srinagar in 1990. Are these the only faces a sensitive photo-journalist could find to depict in a decade of travels; are these really the voiceless innocents he claims to lend his ear to? The sad truth is that Islamic Jihadi terrorism, which has secessionists, separatists and terrorists from the valley in the forefront, has been getting overt and covert support from the political class, so-called liberal brigade, foreign-funded fellow travellers, and complicit sections of the media. The goal is the old Mountbatten-British Raj plan to Balkanize India into tiny statelets that are easy to control, a project that has had an amazing success in the Muslim world. Unfortunately, a large and committed Indian elite is devoted to the cause of British Imperia, whose frustration at the failure to delink Jammu & Kashmir from India is now an obsessive-compulsive disorder. Shome Basu  whose work has been used by Amnesty International to secure the release of many young men detained under that Public Safety Act (he must be well compensated)  selectively finds a Kashmir centred around the separatists and the cause they represent  secession from India. There is a determined effort throughout the exhibition to present Kashmir as an exclusively  and legitimately  Muslim valley, rather than as a land that was the crown of Hindu civilisation, home of Rishi Kasyapa, progenitor of the gods and the human race, and a land whose religious demography was forcefully and brutally changed over centuries of Muslim rule which the brief Dogra kingdom could not undo. In the face of such negationism, Basu naturally focuses only upon the suffering (sic) of terrorists and their families. He lionises the stone throwers, and demonises the security forces when such goons are struck down to maintain law and order. He sympathises with half-widows whose husbands have disappeared for many years, and insinuates that the Indian State is behind this atrocity  but never once notes that hundreds of the ‘disappeared, whereabouts unknown’ are those who walked across the line of control for arms training in the Islamic paradise next door. This is something that was documented at length by Kashmiri Muslim author, Basharat Peer, is his execrable novel, Curfewed Night, where he naturally showcased such traitors as heroes to a grand cause. The walls of the Gallery reek with sympathy for the secessionists, indeed, with complete identification with their cause  another dismemberment of the Indian motherland. Nowhere does the casual visitor get the feeling that the artist is documenting the grim face of the Intifada that was launched in the Kashmir Valley since 2008, which can be traced to Al Qaeda’s call to the terrorists to give a new direction to the terror movement. Yet Basu demonises the security forces engaged in counter insurgency operations and the Indian State at large. There is no appreciation of the fact that the security forces are combating men trained and armed by Pakistan with the objective of another vivisection of the nation. Does Basu really want them to sit like lame ducks and be butchered in cold blood, so that they can strike terror and mayhem all over the country? Is he aware that already more than 2200 security persons have lost their lives to the Intifada tactic of the terrorists? The true victims of Jihadi terror  the Hindu Pandit community, the Sikhs and other Hindus from the 1947 Partition  are missing in the consciousness of the State Government, the Indian State, and also in Shome Basu’s canvas. They are missing in his mind and heart, like the non-persons of the Stalinist era. That is why, in his decade-long forays in Kashmir, Basu found no time to visit any of the refugee camps in Jammu, where Hindu migrants wallow in misery and neglect, refugees in a country that is their own home, but where a political elite is blind and deaf to their grim privations. Moving throughout the State, Basu could not find the heart to see the mass destruction of Hindu property; the abandoned homesteads; the burnt and shattered temples; the massive encroachment of Hindu temple lands; and the heavy human suffering at the hands of the very same JKLF, whose leader, Yasin Malik, is sought to be portrayed as a Nelson Mandela-like crusader for freedom from an apartheid state. Can there be a graver travesty of truth? There is not a word or a picture on the Sikh minority that was targeted at Chittisinghpora, at Magarmal Bagh, and last year asked to convert to Islam or leave. Geelani was embarrassed when openly confronted on this issue, and asked his men to back down. Shome Basu, tell us - do those who have no voice and need you to make themselves heard (presumably abroad, at forums like Amnesty International) really make such chilling threats to their neighbours? Or are you the conduit for precisely such fraternal messages? Indian secularism  an euphemism for denying Hindu identity  can gone too far. We need to check this rot before it devours the nation and the people. Already it has made a meal of the Truth. This exhibition is but an extension of the ISI plan to destabilize and balkanize India. As a public-funded body, India Habitat Centre needs to issue a public apology. Now that the ISI front in US is busted & other Pakistan sponsored so called Kashmir Centres in Brussels & London are under scanner,it is time to expose Indian collaborators who in the guise of journalists, academicians, intellectuals have been instrumental in propagating Pakistani stand that is incompatible with Indian constitutional position on Kashmir.